Alexander (Andy) Shaw Pendleton was 26 years old in 1881 when he married Susan (Susie) Parramore in Valdosta, Lowndes County, Georgia. She was 20. These are my paternal great grandparents. I've never heard any stories of how they met, but I imagine that the two families had known each other for a number of years by the time the young couple married. Valdosta was a very small town back then with a population of just over 1,500 people in 1880. 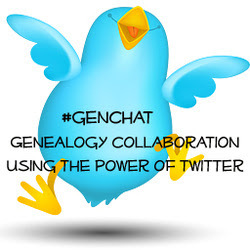 Andy's parents, Philip Coleman Pendleton and Catharine Sarah Melissa Tebeau, moved their family to Lowndes County during the Civil War when Andy was about 8 or 9 years old. 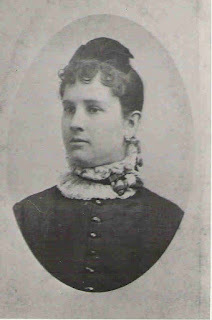 By 1870, Susie's parents, Noah Parramore and Susan Catherine Dasher, had moved their family to Lowndes County from Thomas County, Georgia. Andy, his brother Charles Pendleton, and Susie's brother John Parramore were charter members of the Patterson Volunteer Fire Department in Valdosta when it was formed in 1872. Andy was about 17 at the time, and John was 15. Were he and John friends? Did he meet Susie when he visited the Parramores? At church? Susie would have been too young in 1872--about 11 years old, so Andy probably didn't notice her for several years! Andy was a young entrepreneur by the time he and Susie were married. His father died in 1869 when Andy was just 14 years old. His older brothers were left with the task of supporting their mother and younger siblings. A few years later, Andy began a small fruit stand business in the 1870s (I've seen dates of 1873, 1875, and 1877 in various secondary sources), eventually growing it into The A. S. Pendleton Company wholesale grocery business. The A. S. Pendleton Company letterhead from the early 1900s. This building still stands on South Ashley Street in downtown Valdosta, now the former Southern Salvage building. 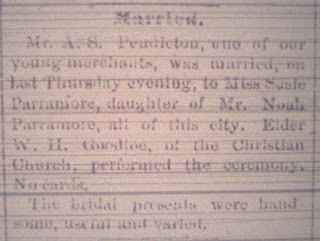 Announcement in the November 12, 1881, Valdosta Times of the marriage of Alexander (Andy) Shaw Pendleton and Susan (Susie) Parramore. 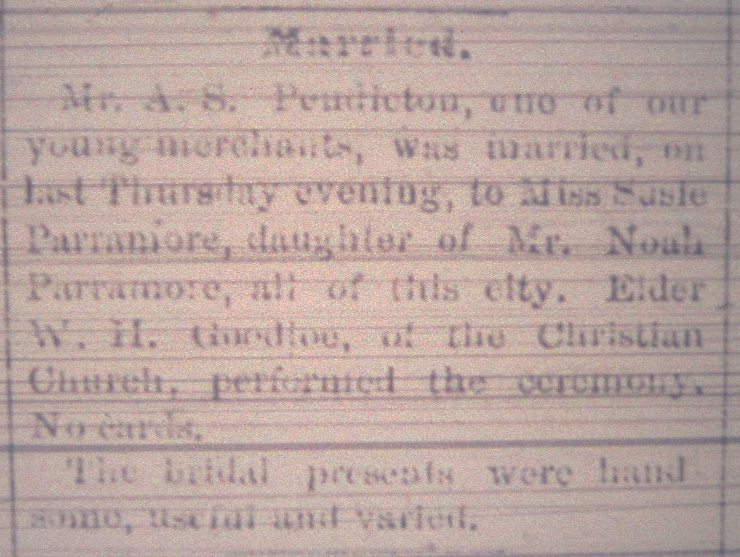 Mr. A.S. Pendleton, one of our young merchants, was married on last Thursday evening, to Miss Susie Parramore, daughter of Mr. Noah Parramore, all of this city. Elder W.H. Goodloe of the Christian church performed the ceremony. No cards. The bridal presents were handsome, useful and varied. date of the marriage.Given under my hand and official Signature Nov 10th 1881B L StephensOrdinary I Hereby certify that Alexander S. Pendleton and Susan S.
Andy and Susie went on to have seven children and spend over 40 years together before Andy died on April 13, 1925, at the age of 70. Susie died nearly 13 years later on February 26, 1938, at the age of 76. Both are buried in Sunset Hill Cemetery, Valdosta, Georgia. Jane Twitty Shelton. Pines and Pioneers: A History of Lowndes County, Georgia 1825-1900. (Atlanta: Cherokee Publishing Company, 1976), 205. "1870 United States Federal Census," database, Ancestry.com (http://www.ancestry.com : accessed 15 May 2013), entry for Noah Parramore (age 50), Lowndes County, Georgia. General James Jackson Chapter, NSDAR, History of Lowndes County, Georgia 1825-1941 (1942; Reprint, General James Jackson Chapter, NSDAR, 1995), 202. Constance Pendleton, ed., Confederate Memoirs: Early Life and Family History, William Frederic Pendleton and Mary Lawson Young Pendleton. (Bryn Athyn, Pennsylvania, 1958), 103, 105. "Married," The Valdosta Times (Valdosta, Georgia), 12 November 1881. 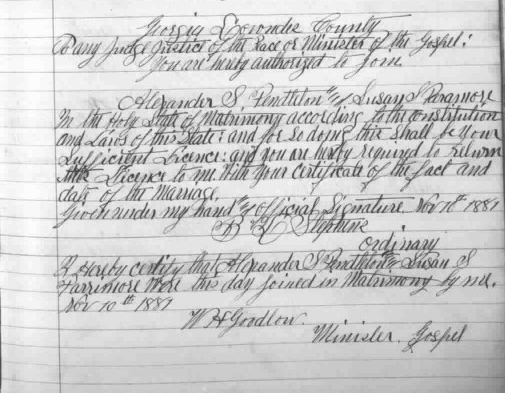 Lowndes County, Georgia, Marriage License Book 1870-1882, p. 411, Alexander S. Pendleton-Susie S. Parramore, 10 November 1881; digital images, Georgia's Virtual Vault, Marriage Records from Microfilm (http://cdm.sos.state.ga.us:8888/cdm4/countyfilm.php : accessed 3 March 2013).